How effectively will you work today? With features including a Volvo developed engine program and I-Shift transmission, the flexible new Volvo FE meets the challenges posed by city or regional distribution, light construction, utilities and refrigerated transport jobs with true efficiency. In the dashboard. On the doors. Above your head. Between the seats. Take a look around the cab of the Volvo FE and you will find an abundance of space to store your items. Plus, you have the option of adding yet more storage units if you so wish. The Volvo FE cab – home comforts, wherever you are. The Volvo D8K Engine. Unrivalled Power and Peformance. 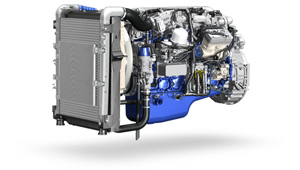 The Volvo D8K engine is a top performer in any situation. Where tight manouevring is required - in heavy urban traffic for example - a lightning-fast response can be relied upon everytime. Offering impressive flexibility and awesome power on demand, the D8K is the perfect match for the Volvo FE. Put it to the test. Make your working day brighter. And safer. On dark winter mornings. Or at dusk, working through the night. When spending long periods on the road, you need a truck fitted with headlights of the highest calibre. 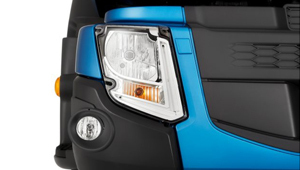 The Volvo FE is equipped with state-of-the-art LED lamps that light your way, whatever the task at hand. A powerful beam can be relied upon to provide an excellent view of what’s happening ahead of you, while flexible lighting around your truck offers an unrivalled field of vision. I-Shift. Forget the gearbox - just drive. 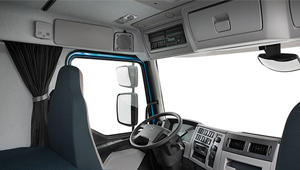 By reducing your fatigue on the road, I-Shift increases your safety and the safety of your fellow road users. Performing in an intuitive way, I-Shift can be customised to suit your exact driving needs. When driving in Economy mode, every gearchange is precisely timed to let the engine work at its most efficient rpm range - reducing your consumption. With the best, most economical gear automatically selected, you can settle back and drive like a fuel-efficiency expert. 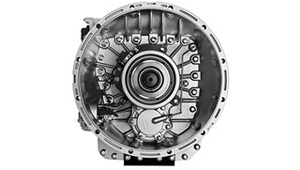 Driving with I-shift can also extend the life of the driveline and minimise maintenance. Good news all round.